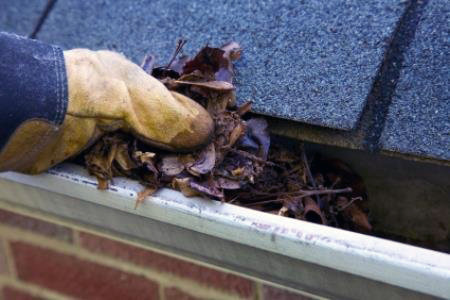 Rain gutters are an important part of your home’s infrastructure. Structurally, they are channels or troughs typically made from soft steel that have been plated with zinc to prevent rust. More usual on residences, gutters are made from aluminum, which doesn’t rust, and is available in many colors. The slope of your roof, the number of gables and dormers and the type of material covering your roof affect the choice of gutters for your home. Gutters serve to direct rainwater away from exterior walls and windows and to protect the foundation of your house. Installed with the proper slope, the gutters channel the rainwater into vertical downspouts that send it away from your house, thereby helping to prevent mold, mildew and dampness in crawl spaces and cracks in the foundation. Without gutters, the runoff from your roof will gradually create trenches in the ground below the overhangs, and if you have a basement can lead to leaks and water damage. Thus, all the water collected by your roof must be directed away from your house as quickly as possible to prevent such damage. Don’t trust your rain gutter installation to anyone else-you can depend on us for getting the job done right the first time, on time and within your budget. Give American Roofing & Vinyl Siding a call today, or complete our online estimate-request form for a free estimate on your home or business’ rain gutter needs.